This is just a small sample of the now hundreds of memes out there. For the largest collection of memes, see this collection. Please provide links in comments below to new articles. I’ll add them. This entry was posted in Political Correctness, Politics and tagged Conservacuck, Conservakin, Cuckservative. Bookmark the permalink. 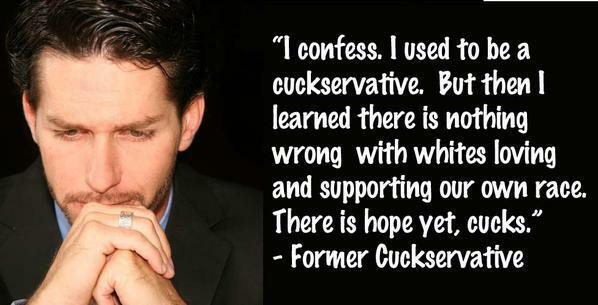 ← What is a #Cuckservative? The American Conservative-based memes are hilarious. The American Conservative actually used to be a decent magazine — before they purged Pat Buchanan and Taki from leadership. Now it’s just an open-borders cuckservative rag. TAC was sold years ago to Ron Unz, who is, surprise, surprise, a Jew. He’s about as good as a Jew gets on our stuff, which is to say – not very. Eg, he does a huge analysis of something Kevin MacDonald has been pointing out for years, that between ‘white’ Jewish IQ, real Jewish nepotism, real Jewish wealth and affirmative action for blacks and browns, there’s no way actual Whites can get into the Ivy leagues on merit alone anymore, and what does Unz conclude? How discriminaory against Asians! Unbelievable. Jews: at their best, they’re still terrible for us. Unz has basically plain bought off Sailer, Peter Frost, Fred Reed and many others with his blogi review. Not that any of these were all that strong on the JQ before, but Sailer’s flirting with it seems to have peaked around the time of Unz. Remember to tweet guys (I’m @AtlanticCent on Twitter). The meme war is the war of ideas. 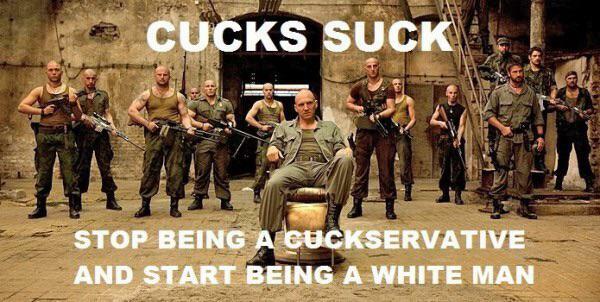 When we get Republicans and commentators to respond to #cuckservative and out themselves as anti-white, it’s going to make right-wing whites scratch their heads. Some may even defect to the alt-right. Democracy made every man a soldier and the internet makes every man a platoon. This does apply to more than just the whole immigration issue, right? These people betray their base on more issues than just that. Erikson’s gay marriage post last month is a good example. That should be the next attack – showing how cuckservatives betray their base in other policy areas – when momentum of this particular form loses momentum. Actually, I deleted the reblog and added instead a more handsome link to this very article. Thanks! Another sickening form of cuckholding are men who marry a woman and take care of her children from a previous male. You’re a special type of cuckhold if the kids are little sprogs from a previous black baby daddy. But the cuckservative shaming of politicians is brilliant. Is someone gonna make T-shirts with this message? “Between the breast pump, the lion, Hillary’s $600 haircut and the ‘cuckservative’ thing, I’ve found Twitter very hard to follow today.” — CNN analyst Ana Navarro. Headline makes a big fuss about his ‘homophobic’ slur because he used the term ‘pansy fester’. Of course, the term ‘homophobia’ is totally bogus, but it has such power simply because it exists and has been widely disseminated. It was promoted by the powers-that-be. It goes to show the power of a word. Just by creating an epithet for something, it makes that thing seem evil regardless of whether it is or isn’t. Same goes for the term ‘cuckservative’. The idea behind it is nothing new. Alt Right has been complaining about white traitors for a long time, but the complaint really began to sting with the invention of the term. 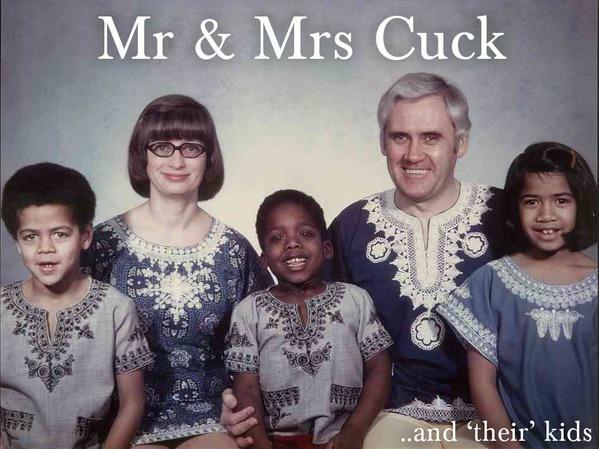 In a way, the term ‘cuckservative’ is more remarkable since it was NOT favored by the elites. Prior to the Net, words gained currency via control of academia, media, and pop culture. It had to be picked up by the mass media to gain national currency. But with the Net, words can go ‘viral’ via social networking, and a new term can arise out of nowhere under the radar of the media/academia establishment. Alt Right need to come up with terms(that may go viral) that is the equivalent of ‘homophobic’ or ‘racist’. A term that describes the various phenomena of anti-white hatreds. Once such a term is created, one merely need to invoke it with a few adjectives to ‘win’ the argument and silence the enemy. Such words are accusatory in nature and immediately put the other side on the defensive. For example, call someone ‘racist’, ‘antisemitic’, or ‘homophobic’, and he feels he must prove he is not. If we had a term that means Jewish hatred of white gentiles, it could be used against Jews and would put them on the defensive merely by the utterance of the word. This guy ain’t no cuck. I didn’t coin ‘cuckservative’ but did mention the cuckoo nature of what the Jews were doing in this blog post. 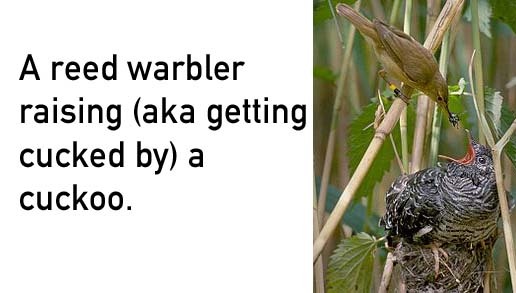 Andrea, you mentioned the phenomenon of the cuckoo bird in an even earlier post.